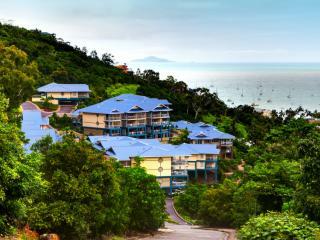 There are many accommodation options for holidays at Airlie Beach in the Whitsundays. Small, personal bed and breakfasts, large resorts jam packed with facilities and dozens of apartment blocks big and small spread across Airlie Beach, the gateway to the Whitsunday Islands. Listed below are the Whitsundays resorts and hotels represented by Travel Online. Here we have more information and booking options for Whitsundays Islands. Airlie Apartments features views over Pioneer Bay and Abel Point Marina and is located 300 metres from shops, restaurants and activities. This Whitsundays accommodation offers 1, 2 and 3 bedroom apartments that are all fully self-contained, ideal for couples or families after modern and comfortable accommodation. If you are looking for modern and comfortable accommodation in Airlie Beach that is close to restaurants, bars, shops, the beach and tour departure points then Airlie Beach Hotel is for you. This Whitsundays accommodation offers restaurants, bars, a swimming pool, parking and complimentary WiFi internet. The rooms and suites offer views of the ocean or the township and they are ideal for couples and families. This Whitsundays accommodation is ideal for those after modern self-catering facilities that is within 15 minutes' walk of Airlie Beach and the shops. Azure Sea Whitsundays boasts two swimming pools, a air conditioned gym, BBQ facilities plus much more. This Airlie Beach apartment accommodation is a great place to base yourself while discovering the stunning Whitsunday Islands. 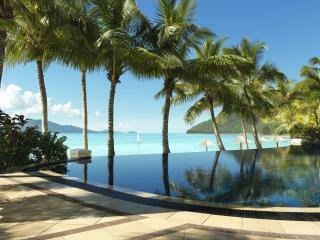 Hamilton Island - Beach Club provides a relaxing holiday experience in the privacy of this absolute beachfront resort. Renowned for its beachfront views and contemporary, luxurious rooms this boutique hotel features an infinity edge pool, Club Lounge and Bar, VIP buggy chauffeur service, 24 hour reception and restaurant. The Beach Club is an adult's only resort allowing you to relax and indulge in the best the Whitsundays have to offer. 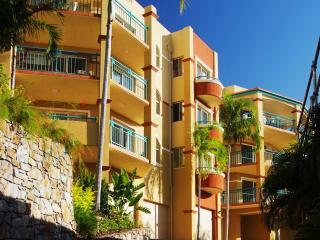 Blue Horizon Resort Apartments is located a short distance from the main hub of Airlie Beach. These luxury apartments face towards the glistening Coral Sea and are Balinese inspired with open plan lounge and dining areas. This Whitsunday accommodation is ideal for a romantic getaway, families or groups that are looking for a modern self catering holiday. Coral Sea Resort offers a true boutique hotel experience and is the only absolute waterfront resort on the Whitsunday coast. A perfect couples retreat or extended family holiday destination. The resort captures the essence of a tropical lifestyle and is an ideal step-off point for day tours to explore the beautiful nearby islands and the Great Barrier Reef. 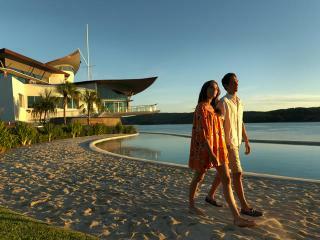 Daydream Island Resort is a tropical paradise located in the magnificent Whitsundays. Daydream Island offers a complete range of facilities to enjoy including the Daydream Rejuvenation Spa, open air cinema or National Park. A perfect place to recharge your batteries. Hamilton Island - Throughout the island there is a number of self-catering, individual accommodation ranging from apartments to houses that sleep up to 8 people. Each is situated in their own grounds but generally share a swimming pool and landscaped gardens. Styles vary in price and include studios, two storey and split level accommodation. Hamilton Island holiday homes require a minimum 3 night stay and include a complimentary 4-seater buggy. Located along the waterfront of Dent Passage and the nearby islands, Hamilton Island Yacht Club Villas are the ideal accommodation choice for a luxury stay on Hamilton Island. Adjacent to the Hamilton Island Yacht Club Restaurant and Bar and surrounded by lush landscaped tropical gardens, the villas are close to the marina and offer fantastic water views. 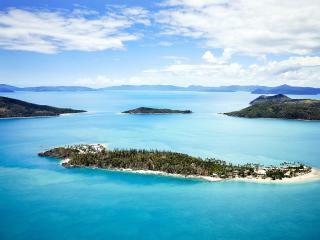 Hayman is the most northern island in the Whitsunday Island group. Renowned for its elegance, service and superior location in the Great Barrier Reef, InterContinental Hayman Island Resort is a unique 5-star resort. Enjoy stunning views of the Coral Sea right from your bedroom at the Mantra Boathouse Apartments in Airlie Beach. This Whitsunday accommodation offers guests contemporary designed 2 and 3 bedroom apartments to choose from. Located just 45 minutes from Proserpine Airport, and just a short walk to Able Point Marina, this property is a great base when wanting to experience the Great Barrier Reef and nearby Whitsunday Islands. Perfect for families and couples, come and experience all that Airlie Beach has to see & do! This Whitsundays accommodation is set a short distance from the heart of Airlie Beach in Cannonvale. Mantra Club Croc offers an affordable holiday destination for singles, couples and families to enjoy. The Great Barrier Reef and Whitsunday Islands are at your finger tips plus you can take advantage of the hotel facilities including lagoon swimming pools, a restaurant and bar plus tour desk. Martinique Whitsunday has established an exciting new benchmark for self contained tropical holiday accommodation. With superb views - Coral Sea to Hayman Island this Whitsundays accommodation offers a 20 metre wet edge pool, spa and gymnasium. Featuring luxury 1, 2 & 3 bedroom air conditioned apartments, spacious breezy balconies with ocean views, convenient lift access from street and undercover parking levels. 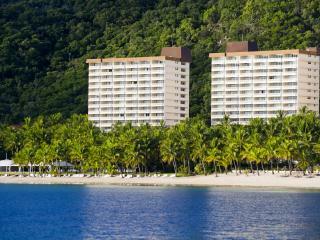 Hamilton Island - Palm Bungalows are located near the Resort Centre, restaurants, swimming pool and Catseye Beach. Affordable island accommodation at its best, Hamilton Island's Palm Bungalows offers private free-standing bungalows surrounded by tropical gardens and feature their own private balcony with exotic garden views. Whether you want to enjoy a romantic escape or a peaceful and relaxing Hamilton Island holiday, Palm Bungalows are a spacious and secluded island haven. 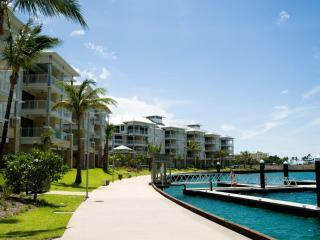 Peninsula Airlie Beach comprises of luxuriously appointed fully self contained apartments and penthouses. The property sits on a spit of land jutting out into Abel Point Marina and is absolute waterfront with expansive views over the marina and the Whitsunday Islands in the Coral Sea. 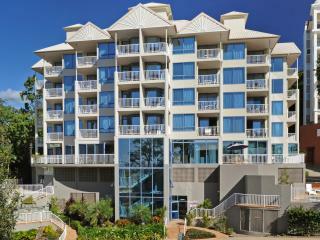 Peppers Airlie Beach is located only 700 metres from the main street of the charming seaside village of Airlie Beach. The resort offers the most stylish and elegant accommodation in Airlie Beach with 102 luxuriously appointed 1, 2 and 3 bedroom apartments boasting full kitchen and laundry facilities and incredible panoramic ocean views. On site facilities include Tides Restaurant & Bar, Endota Day Spa and a stunning wet-edge pool. 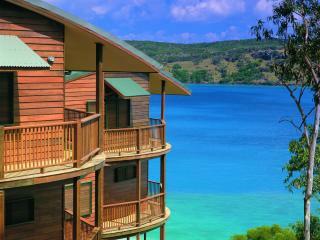 Pinnacles Resort overlooks Airlie Beach, the Whitsunday Islands and Conway National Park. The resort consists of 29 stylish 1, 2 and 3 bedroom apartments. Each 2 & 3 bedroom apartments has its own jacuzzi built into its large terrace while each 1 bedroom has its own inside spa tub. All apartments feature large balconies, are fully self contained and have air conditioning. Facilities include a heated pool and gymnasium with sauna. 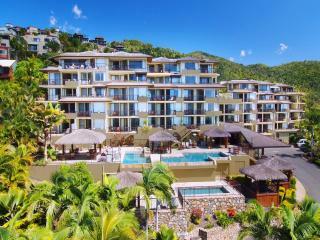 Hamilton Island - Reef View Hotel is renowned for its breathtaking views of the Whitsundays. The upper floors feature a range of luxury suites including the Reef Suites, 1 and 2 bedroom Terrace Suites and the plush Presidential Suites. Each suite has its own private balcony overlooking the Coral Sea and the spectacular Whitsunday Passage. The lower floors are home to spacious, modern rooms with contemporary furnishings and garden or Coral Sea views. On site facilities include a bar, restaurant, shop and swimming pool, making Reef View Hotel one of the most sought after accommodation options on Hamilton Island. Luxuriously appointed fully self contained Tuscan Villas, ideally situated in the heart of the tourist strip, with superb views over the turquoise waters of the Whitsunday Passage to Hayman Island and beyond. 1, 2 & 3 bedroom air conditioned with fully appointed kitchen, own laundry, lockup garage and spacious balcony. Resort has 4 swimming pools, BBQ facilities and is close to all amenities. Offering the luxury of hotel facilities like housekeeping and movies on demand with the home away from home feeling of a full size kitchen, Whitsunday Holiday Apartments are a popular accommodation option for families and couples holidaying in Hamilton Island. These self catering apartments offer landscaped gardens as well as a pool and spa giving you the independence to enjoy your Hamilton Island holiday with all the mod cons of a hotel or resort. At Marina Shores offers absolute waterfront 1, 2 and 3 bedroom stylish luxury apartments. All apartments feature spacious private balconies and have beautiful views overlooking the marina and nearby Whitsunday Islands. 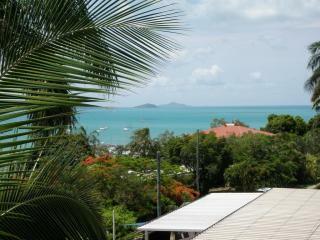 Airlie Beach is famous for it's variety of restaurants, bars and nightlife and is a gateway to the Great Barrier Reef. at Waterfront Whitsunday Retreat is luxurious boutique accommodation located in the Whitsundays, offering guests a choice of spacious spa suites and penthouses. Situated at Pioneer bay, and only minutes from Airlie Beach, Waterfront Whitsunday Retreat is surrounded by pristine turquoise water and breathtaking rainforest. With accents of a South Sea Island, at Waters Edge Resort has created a new meaning to tropical living. 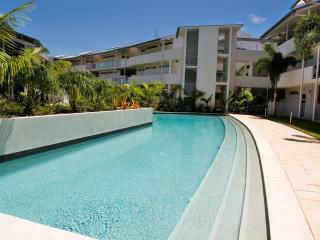 An oasis of calm serenity nestled in the hillside above the cosmopolitan village of Airlie Beach. Relax in your luxury apartment while watching the islands shimmering upon the horizon change from turquoise to soft lilac at dusk. at Whitsunday Vista Holiday Apartments offers guests a choice of air conditioned distinct style apartments from romantic studios to spacious 1 and 2 bedroom apartments. Relax and enjoy a drink from your private balcony with uninterrupted views of the Coral Sea and Whitsunday Islands. Facilities include a swimming pool, heated spa, laundry facilities and undercover parking. 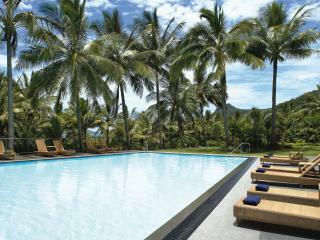 Located just a few minutes from Airlie Beach, where you can enjoy the many fine restaurants, boutiques and nightclubs.